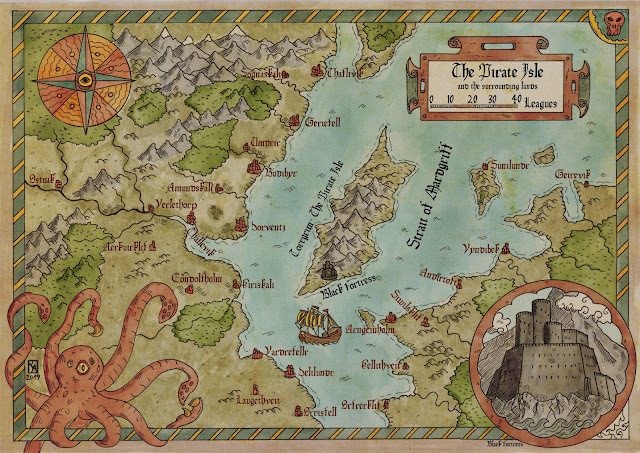 Here I will write mostly about my work as fantasy cartographer and artist and do some book reviews from time to time. A traditional piece - hand drawn with 0,1 fine line on A4 sized paber, scanned and then coloured and labelled digitally. The Termian March protects the Empire from the dangerous green Elves. They rule the area beyond the shield mountains from their Emerald Palace. Scanned drawing, already cleaned up. I'm your man if you need a fantasy map. My name is Robert Altbauer and I'm a freelance fantasy cartographer and illustrator living in Salzburg, Austria. I'm a lifelong addict to science fiction, fantasy and alternate history, and became a cartographer some time ago, when I more or less rediscovered the fun of drawing - something I had done as a child and teenager, but nearly forgot during my school and university years. Today I can create a wide range of maps for you: world, regional and city maps, dungeons and floor plans in many styles, top-down isometric and other views. I have done numerous maps for roleplaying game publishers and developers, PC and browser game companies, app developers, writers, RPG players and people who simply like to decorate their room with a fancy map. My work can also be seen in several successful Kickstarter projects, and I can proudly say that my input als fantasy cartographer always helped to succeed.